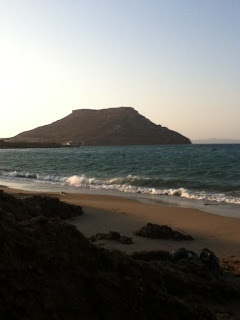 There are so many lovely places to stay in this part of East Crete. You could stay up in the larger village of Palaikastro, or down by the beach at Kouremenos, or hidden away among the olive groves that separate the villages from the sea... I will be spending all of September in this area this year, so I'll fill this section out with lots more details then. For the time being, the only place I have stayed in the Palaikastro area, with my dog, was at the Philoxenia Rooms in the beautiful village of Agathias. Unfortunately, I don't have a better photo, so you'll just have to take my word for it. The rooms are very clean, a good size, and reasonable (I think we paid about 35 Euro per night in high season), with air conditioning, fridge, tv. 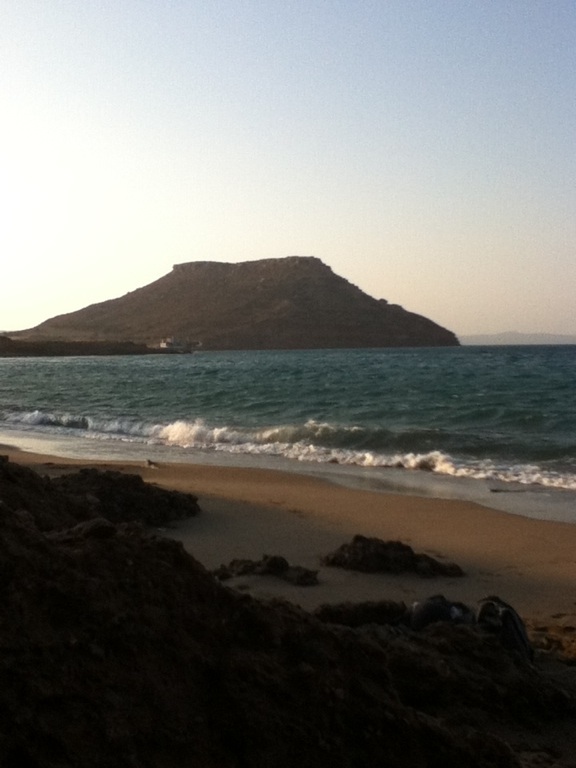 They also have some of the nicest views in the whole of East Crete (in my opinion, that is). From the balconies on the backside of the building, you have views out over a sea of silvery-green olive trees, to the characteristic boxey shape of Kastri mountain down at the shore, and the long sweep of Kouremenos bay. I have known the owners here for a few years, and they are a really lovely, friendly couple. They were absolutely fine about Sage staying in the room, and made a bit of a fuss of her whenever we saw them. I don't know if it's a policy to allow pets, but they were very accommodating and relaxed about it. We had a really nice few days staying here. I love the beaches in this area, there are so many small coves and places to escape to, as well as the larger, more well-known beaches such as Vai and Itanos which are close by. The village of Agathias is much more beautiful than Palaikasto, with some of the traditional old houses remaining. The streets are narrow and the whole village is balanced on a steep hill - it's exhausting just going back to your room at the end of an evening. From here you can climb up to the Minoan sanctuary of Petsofas, for some really breathtaking views of the mountains and bays around Palaikastro and down the coast to Zakros. You can also visit the Minoan settlement of Palaikastro, which is just off the unmade road from Xiona Beach.